This delightfully entertaining story introduces the reader to Meghan and Sean O’Sullivan, their three grandaunties, and Lucky O’Leprechaun, who has pestered the O’Sullivans since the time of the Vikings. Throughout the story, Meghan and Sean debate over what they will ask of Lucky O’Leprechaun if they catch him. Will they ask him for his pot of gold, or will they discover that some things are even more precious? 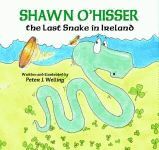 The brilliant illustrations and whimsical text will not only captivate children but also teach them a wee bit about leprechaun as the lad and lass repeatedly attempt to capture the tricky little fellow on St. Patrick’s eve. 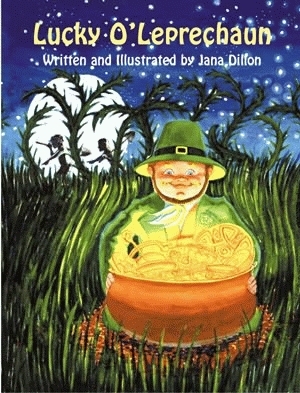 Jana Dillon is a prolific author and illustrator of children’s books, including Lucky O’Leprechaun Comes to America, Upsie Downsie, Are You Asleep?, Lucky O’Leprechaun in School, and Little Thumb. A second-generation Irish-American, she frequently visits elementary schools to teach children about the “Little People” as well as about the creative processes of writing and illustrating books. Her vibrant, captivating illustrations have been exhibited in several museums. She lives in Canton, Massachusetts.